They measure approx. 5cm including the Sterling Silver earwires. The glass pieces are 1.4cm x 1.4cm and are made of two layers of glass. A layer of opaque Lilac glass, topped with a layer of Pink patterned translucent Dichroic glass. 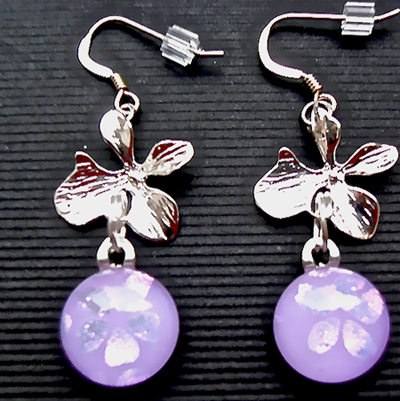 The plated silver orchid shapes are 1.8cm x 1.8cm and are connected to the earwire by a Sterling Silver split ring. The earrings come in a nice Black or Silver card gift box. There are two matching bracelets.